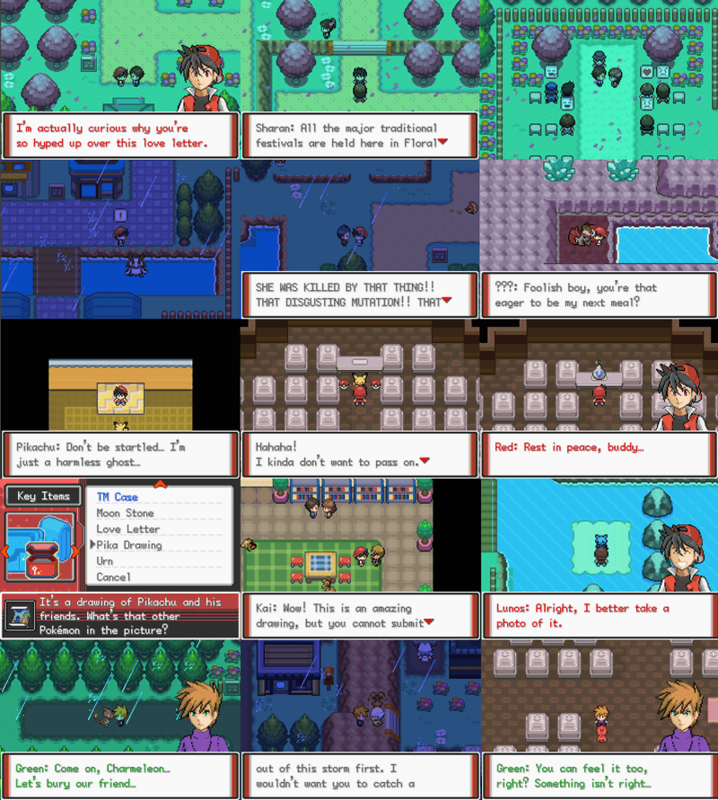 This game is based on Pokemon Adventure Red Manga and the creator changed some events to make the game longer and entertaining. Some items, Pokemon, and skills added making the game even more different and improved from the original FireRed game. Pokemon Adventure Red nominated as top Pokemon Hack for several years; fans are eager to play the game, and some are waiting for new updates and improvements. 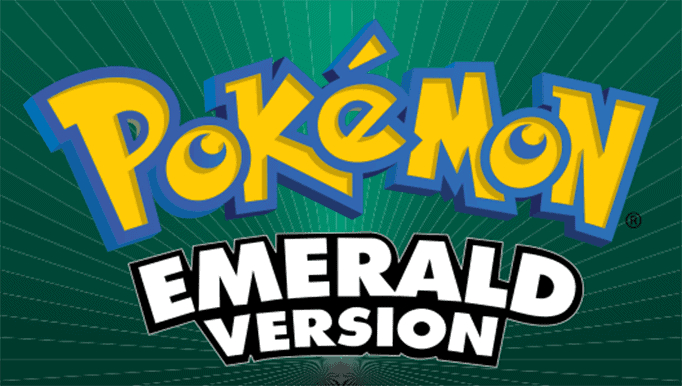 See Pokemon Adventure Red Chapter in action, Watch the video here. 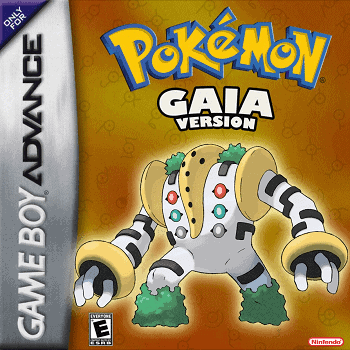 The Pokemon Adventure is based on Pokemon FireRed US version 1.0 ROM, to play the game you need to have a Gameboy Advance emulator, I suggest using MyBoy or any of these recommended GBA emulator for Android. Grass-Type deals normal damage against Flying-Type. Bonus/optional events that changes storyline. 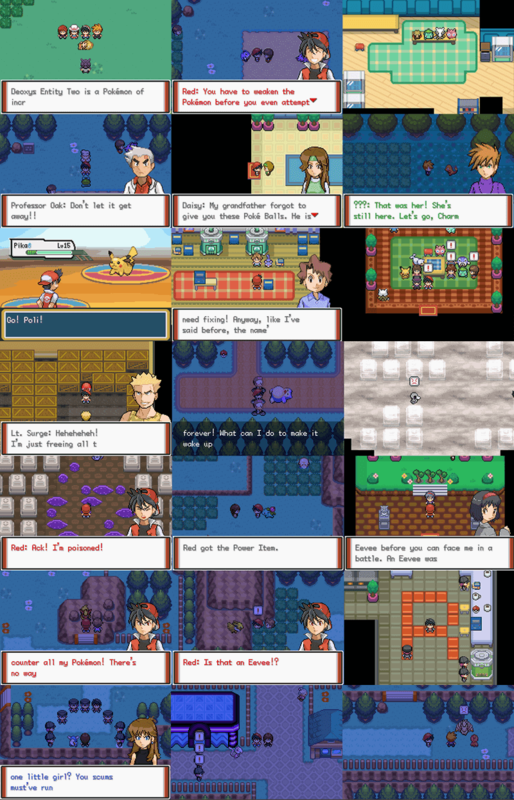 Several reference to the Pokemon anime, pop cultures and other games. EV are now indicated in Pokemon’s stat screen. Hi, it seems like my VBA can’t open the game, gets stuck on white screen. I patched it with NUPS Patcher. Any idea on how to fix this? I don’t understand. I need help. I try to download but I get an error. First, you have to patch that .ups file to your FireRed rom, to do that you need a patcher and I recommend using NUPS. What is that prior ROM file you are talking about? You can’t.You have to wait for beta 14. It’s very misleading, I too just completed the region thinking it was fully completed, just to get slapped in the face that I cannot continue, it even got my hopes up after I saw that ??? guy with 6 lvl 255 pokemons. Just download GBA4iOS in safari and your good to go! Well, download a ups patcher, such as Tsukuyomi http://www.romhacking.net/utilities/519/, which i used. 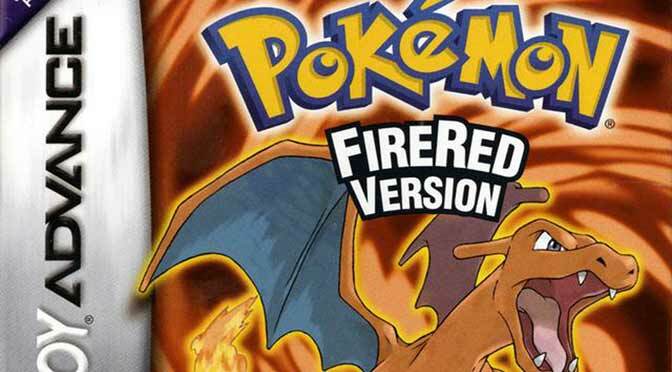 The base ROM for this ROM hack is Pokemon Fire Red 1.0. So download the exact same version of Pokemon Fire Red (1.0, not 1.1) from some torrent site or maybe even some websites (I used http://www.romhacking.net/utilities/519 and use Tsukuyomi (using the UPS patcher needs no explanation). But….i really hated the beginning….stuck with a PoliWhirl….and then a bulbasaur forced on me..and a Pikachu, although i dont really mind the pikachu…why the others..i know you said it was to follow the anime, However could it really be that hard to make it to where you pick your starter.. it just..like, i really wanted that JiggilyPuff in the begining…otherwise its great. But that begining though..ive even asked for a full set of wild pokemon modifiers in the cheat comment section just so i can fix this….like…oof. To all and any who want to play this. -WARNING- The creator is appearently redoing a lot of this game, and you can only play until the first region is done, and there is nothing more then regular pokemon, there is a good game, with good storyline good pacing (confusing as hell with the map and how what your supposed to do at time and rather vague.) otherwise its rather fun, and it took me about a week to play though using hyper mode. There is a tons of side quests and cool pokemon, some dark things are there as well. 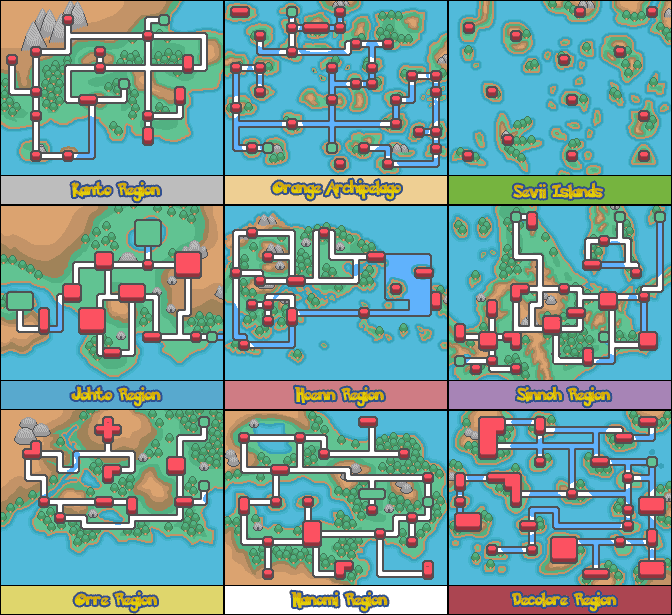 So know that you can only do the Kanto Region the others arent up yet. they are being redone. So no fairy typing, no mega’s no legendaries you can catch until the end of the regular game (The three legendary birds) you can do the Indigo league however thats it, when it tell you to use the blimp to get to the next area, thats the end of the current game. Also can you guys @PokemonCoders take this off the #CompletedPokemonRoms list? we are going to get Beta14 and only get 1 more region and then we have to wait until the next one. and its really confusing, some people say its completed and there is more youtube video content on the old version, however as it is, its not the complete game you guys are advertising. Seriously nothing against you, i just was really dissapointed to find out i cant leave Kanto and when Beta14 comes out, i only get 1 more region. How do I find the blimp which is in vermillion which goes to orange island is the game is completed? Dude, same, i cant find the blimp, i see many of the older versions on youtube that have it, but i cant find any Beta 13 gameplay footage showing the blimp. i found one person with beta 13 saying we have to wait for beta 14. But everyone is saying the game is complete, so how are we supposed to get to the rest of the game, i even looked at the game files and the rest of the game is there, i just cant find a way to get to any of it. Can someone please address this issue? What to do after I have gained the volcano badge. Cant find the blimpin vermillion city after completing the indigo plateau. Hey i lost in against a rocket team member under the casino and now i’m stuck in a dark place and i can’t move, is there any solution ? I want to give my regards and my thanks to the makers of this rom for this wonderful and excellent game! 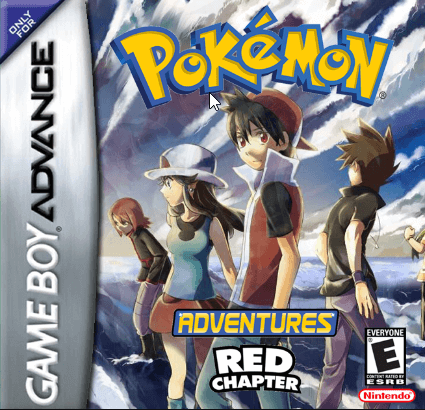 How can I get a .gba file of Pokemon Adventures Red Chapter. You need to patch the .ups to your FireRed game. Does anyone know how to evolve the goddamn Sarapi? Reaching LVL45 without doing so makes me think it takes something else. I’ve tried pretty much everything that came to my mind tho. Love it so far. How complete is this hack? Well, it’s already completed with constant update to further improve the game. This game has problem with the level modifier code, it lags when the code is entered and encountering the Pokemon. Hi I downloaded the patch and tried using it but I got a error saying it was invalid. Is there supposed to be a certain way to download it or cornvert it into something else. Bro, if you’re having hard time patching the game I would suggest just look for the prepatched version of this game. You can easily find them with Google. This is not a GBA rom file, you have to patch this first to your FireRed rom to play the game. You may read this tutorial Lunar IPS Patcher Download – Patch IPS Files To Play Pokemon ROM Hacks. Ok sorry but i got everything ready downloaded and extracted ready to patch but it said error unknown patching format. I can’t seem to find the game. I downloaded from the website and then from the Google drive . I went to my boy and it wasn’t showing. I confirmed I downloaded it but still didn’t show. 1. In “bicycle contest”, sometimes only black screen appears. 2. In dive, black water appearing, not blue. 3. As compare to official FireRed story, player got gym badges without gym match except “pewter city, ceruleen city and celadon city gym match. 4. In Pokemon center, when connect to Professor Oak’s PC for pokedex rating, then this this is not working. 5. When caught new pokemon such as Sarapi, Kangaskid, then only showing information about “Ratata”. I don’t know why Kangaskid evolves in Cubone, not Kangaskhan or Kangaskhoo. 6. Pokemon use HM moves without learn, if Pokemon learns HM moves like Poliwarth learned “surf” and try this, then other pokemon showing acts, not that pokemon that actually learn this think. 7. Without map, this game is bit complicated. And sometimes starting chapter not appearing, only showing end of chapter blah blah blah. Bonus chapter is still incomplete such as “one tail vulpix”. I think need better works in chapter wise story. 8. Some thinks are violent and not recommended for kids. Please fix all these necessary, I know developer is working best, but first fix this bugs. Hi there GS27, thanks for dropping here and this information is indeed very useful for the author of Adventure Red Chapter to fix the remaining bugs of his game. On the 2nd bug,it is supposed to be black water. On the 3rd bug,IT IS NOT A BUG,ITS PART OF THE MANGA! On the 6th bug,its a feature in the game…. Very very good, aside from some bugs that make the game unplayable. The special Eevee has a nack for becoming a “Bad Egg” when its in one of the fakemon forms and you switch between characters for a short while. That and the crashes. I’m assuming those are to be expected but still. Very good and I cannot wait to see the rest of what is panned. FireRed and modified editions are impressive, but Pokemon battle background looks still classic, not modern, only last 4 provided battle screenshots in this page are impressive, I request to modify battle background, specially battle background colour with working cheats, and many users don’t know that Visual Boy Advanced is now updated, in v2.10, changed many thinks and Visual effects are outstanding. Wherebis the beta 13 part 2? u put this under completed rom hacks but its listed as beta 13. The story is already completed but the developer is still making occasional updates of this game to improve the features, sprites, structures, etc..
How many gens in this? From which generation’s Pokemon is in this game. 1-3 or higher. Plzz reply.. I stuck too . Visit in pokecenter doesn’t help ,that’s shame…what to do ? I downloaded it by mirror g drive and it’s part 1 should be like that? I updated the ips patch file download, it the most recent version of the game you may want to check it.